OK, it's not all the way finished, but it's getting there. On our last reenactment, we noticed that her yellow dress was super small. It shrank (she grew), I think. 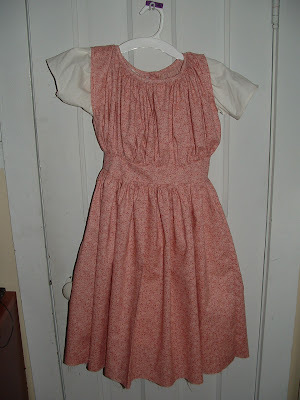 Her other dresses were darker in color, and she was sad that her "girl" dress was gone. So I bought some more fabric today that was pinkish. She'll be super happy to wear her new dress this weekend. 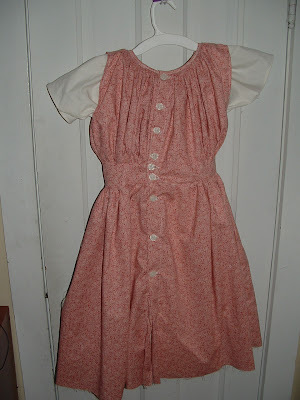 I need to attach some arms to it, and hem the bottom, then it's done. It's a pinafore, with a waist. I thought it turned out pretty good. Should look much better on. The white thing underneath is her chemise.